I am reading...Just finished Mistaken Identity. Very good, very interesting. Thu: I never have anything on Thursdays! 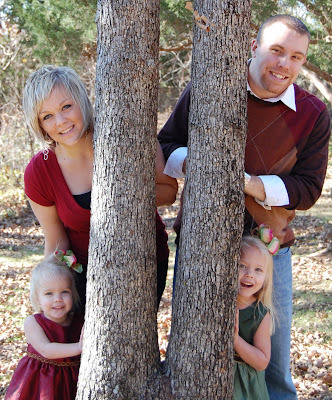 Here is one of our christmas card pic my sister Katie took of us. I'm very pleased with the way they turned out! I also need to update my picture of the girls. I always enjoy hearing your "things". Okay I'll be available on Thursday for roast.Ha! We loved the pictures. I guess I need to call you for an appointment. The Thunder got close maybe next time. Love your blog. Isn't Mistaken Identity crazy? That story amazes me!